Looking for deals in Granada? Located 5 minutes’ walk from AVE Train Station, Catalonia Granada features a swimming pool and a roof-top sun terrace with city views and bar service. There is free WiFi available throughout. The room is very clean , bed is big and very comfortable ,very helpful staff , good value for the money . The Shine Albayzín design hotel occupies a 16th-century palace on the Carrera del Darro in Granada. All air-conditioned accommodations features stylish décor. Wonderful, helpful staff. Great breakfast. Comfortable artistically pleasing hotel. Hotel Los Tilos is located in Granada's central Plaza Bib-Rambla. The hotel features a rooftop terrace with great views of the Alhambra, Albayzín, Sacromonte and Sierra Nevada Mountains. Very central and excellent value for money. The staff couldn't be more helpful. An enjoyable stay. A 19th-century manor house, situated in the heart of the city, Villa Oniria has been carefully restored in a traditional Andalusian style. Very friendly and efficient welcome. Car was parked by hotel for extra fee as advertised. Set in a 19th-century palace, 2133 feet from Granada Cathedral, this beautiful luxury hotel offers a spa. The UNESCO-protected building features a garden with Arabian-style fountains. it is clean and staff is very kind. location is center of the city. it is antique place. Set in Granada, 1312 feet from Granada Cathedral, Mirador del Jazmín offers accommodations with a garden in a building dating from 16th Century. Beautiful hotel in a great location of Granada’s Old Town. Wonderfully restored historic building. Monjas del Carmen is in a pedestrian street in central Granada, next to Plaza Nueva and the Moorish Albayzín Quarter. Its soundproofed rooms have flat-screen satellite TV and a laptop safe. This was my second stay. There will definitely be a third. Just a 5-minute drive from Granada’s historic center, the Ibis Granada features a seasonal outdoor pool, a restaurant and modern rooms with a flat-screen satellite TV. The staff were great. So helpful and friendly. In an impressive historic building, La Casa de la Trinidad offers chic accommodations in the historic center of Granada. Rooms include free Wi-Fi and a flat-screen TV. I was in a beautiful corner room where I could see the square. Ohtels San Antón Granada overlooks the Genil River and is set opposite Granada’s Convention Center. It offers a small outdoor pool, free Wi-Fi and great views of the Alhambra and Sierra Nevada. Very nice hotel. The room was very confortable. Staff was excellent. Rooftop was awesome! Situated in the historic district of Albayzin, at the foot of the Alhambra, this offers unique accommodations within a noble house dating back to the end of the 15th century. Location is great, and desk staff are good. Bed comfy and shower is good. Love the building.! This converted 16th-century Franciscan convent is located in Granada’s Old Town, next to the River Darro. We received a warm and very informative welcome from the desk staff. Eurostars Puerta Real has an ideal setting in the center of Granada’s old town, around a 15-minute walk from the famous Alhambra. It offers a spa and a a roof terrace with bar and panoramic views. Everything. This is a brand new hotel very well designed and maintained. Featuring free WiFi, these colorful suites are located in a 19th-century building, 328 feet from Granada Cathedral and the Capilla Real. The Suites Gran Vía 44 offers private parking. Apartments are great. Good location and, helpfull and kind staff. Nice common areas. Set around a traditional Andalusian-style courtyard Vincci Albayzin features air-conditioned rooms with free Wi-Fi and 24-hour front desk. The hotel breakfast buffet was delicious! Super friendly staff and great location! Hotel Abades Recogidas is located in Granada city center, 10 minutes’ walk from Plaza Nueva. It features air-conditioned rooms, free Wi-Fi and a terrace with a good view of the Alhambra. King size bed and very large shower that seems to be pretty newly renovated. 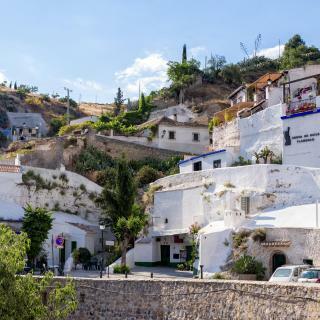 A 25-minute walk from Granada’s Alhambra, Hotel Párraga Siete is in a charming 19th-century building in the historic quarter. It features stylish rooms and a restaurant. Great location, bed very comfortable and modern decor. Carmen de la Alcubilla del Caracol is located in Granada, a 10-minute walk from La Alhambra. Set in a characteristic Granada house, this hotel offers free Wi-Fi and valet parking. Our stay at Carmen de la Alcubilla del Caracol was the culmination of a dream. Centrally located, Hotel Posada del Toro is 215 yards from Granada Cathedral and Plaza Nueva. It has rooms with a private bathroom and free Wi-Fi in all areas. The location is perfect. The staff is friendly, helpfull, & fast response. Located on Granada’s central Gran Via Avenue, Granada Five Senses Rooms & Suites is just 656 feet from Granada Cathedral. Excellent location, within walking distance to most of the major sites. The 16th-century Palacio De Santa Ines, in the Unesco World Heritage Albayzín district, is a 5 minute walk from Granada Cathedral. The location, the decor of the house and the room. 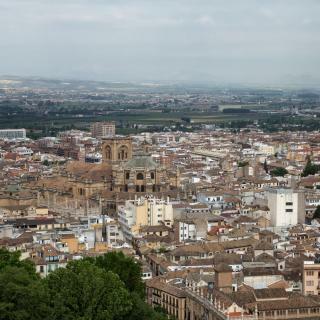 What are the best hotels in Granada near Federico Garcia Lorca Granada-Jaen Airport? 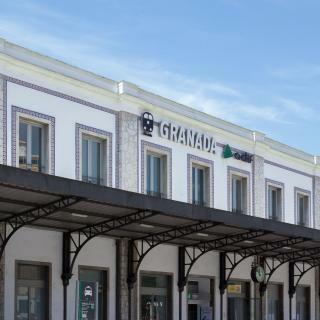 Travelers who stayed in Granada near Federico Garcia Lorca Granada-Jaen Airport (GRX) have said good things about Hotel Marinetto, BS Capitulaciones, and Casa del Trigo. 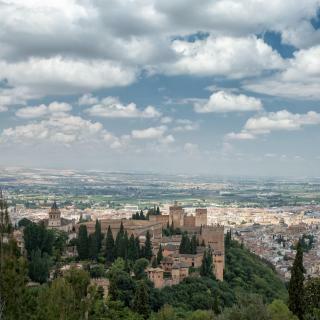 What are the best hotels in Granada near Alhambra and Generalife? Some of the best hotels in Granada near Alhambra and Generalife include Apartamentos Turísticos Mauror, La Cauracha and Alhambra Slowhomes. Which hotels in Granada are good for couples? These hotels in Granada are highly rated by couples: Eurostars Catedral, Mirador del Jazmín, and Hotel Santa Isabel La Real. Which hotels in Granada offer an especially good breakfast? For hotels in Granada that serve highly-rated breakfasts, try Mirador del Jazmín, Catalonia Granada, and NH Collection Victoria. How much is a hotel in Granada for this weekend? The average price per night for a 3-star hotel in Granada this weekend is $266 or, for a 4-star hotel, $291. Looking for something even fancier? 5-star hotels in Granada for this weekend cost around $364 per night, on average (based on Booking.com prices). Which hotels in Granada are good for families? Many families visiting Granada loved staying at Carmen de la Alcubilla del Caracol, Eurostars Catedral, and Room Mate Leo. How much does it cost to stay in a hotel in Granada? On average, 3-star hotels in Granada cost $87 per night, and 4-star hotels in Granada are $98 per night. If you're looking for something really special, a 5-star hotel in Granada can be found for $186 per night, on average (based on Booking.com prices). How much is a hotel in Granada for tonight? On average, it costs $68 per night to book a 3-star hotel in Granada for tonight. You'll pay around $76 if you choose to stay in a 4-star hotel tonight, while a 5-star hotel in Granada will cost around $142, on average (based on Booking.com prices). Which hotels in Granada have nice views? Mirador del Jazmín, Carmen de la Alcubilla del Caracol, and Hotel Casa Morisca got great room view-related reviews from travelers in Granada. Which neighborhood is the best one to stay at in Granada? Granada City Center, Genil, and Chana are popular with other travelers visiting Granada. Which hotels are the best ones to stay at in Granada? Eurostars Catedral, Hotel Santa Isabel La Real, and Shine Albayzín are some of the popular hotels in Granada. Granada is an amazing city. Granada is an amazing city. Large enough to have all the services of a big city, but small enough to walk, and feel like you're in a small town. 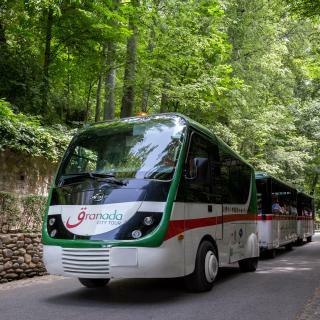 Getting around Granada is quite easy; walking is my preferred method, but the buses and the metro will take you every where you want to go. There are so many wonderful restaurants. I can highly recommend Casa Colon, Bar Leon, and for a wonderful breakfast, Duran. Beautiful city. Alhambra was amazing but get tickets very early. We had to do a tour to get in as no more individual tickets. Nice afternoon and evening in Sacromonte at cafe looking at Alhambra and finishing with Flamenco dance. Visiting The Alhambra is a must. Visiting The Alhambra is a must. Best to take the direct bus there which goes uphill and walk back down when your tour is over. Better food is found at places on the side streets where more locals frequent. We were surprised by the size of the city! We were surprised by the size of the city! We drove to our apt and parked. I would not do this again. I would drop the car at the train station and taxi in to the historic center. It is a lovely walkable town, but also has good taxi service and easy to use buses. The Alhambra, Generalife, Albaicin, and parador made it an awesome experience. Unfortunately, we had 3 rainy, cold days. We just tried to imagine how delightful it would have been with a little sun and warmer temps. We loved visiting the cathedral and La Alhambra. Beautiful hotel in a great location of Granada’s Old Town. Wonderfully restored historic building. Excellent view of Alhambra. Beautiful room - comfortable, clean, balcony, large. Lovely quiet garden. Excellent breakfast on the terrace. Host, Jesus, was great. Friendly, helpful, knowledgeable, and accommodating. He is doing a fantastic job restoring and running this hotel. I had a wonderful stay. Everything was perfect and exactly what I was looking for in Granada. I highly recommend this hotel. Everything was absolutely perfect! The apartment was super clean and comfortable, the location was highly convenient, the owners were very attentive and hospitable and the terrace views of the Alhambra and the Albaicín were amazing! Cannot recommend highly enough. I have been to Granada many times and stayed in all sorts of hotels, hostels and apartments, this is by far the best place I've stayed in. Will definitely stay here again next time. Thank you Apartamentos Mirador Alhambra! This is the best location to be in Granada after visiting the city three times. Accommodation is beyond amazing. Very comfortable first class apartments. The host is one of the best people I have ever dealt with in my travel. Maria made our arrival very smooth and comfortable and gave us great recommendations for near by restaurants and activities. Our stay at this hotel was one of the best highlights of our trip. I like the location of the hotel. It is very close to the main street. The room is not very big but very confortable. The bathroom is almost as big as the room, which I like very much. It was a really cold two nights in Granada during my stay but the heater in the room was enough to keep me warm during my sleep. Also, the staff was very friendly and helpful in giving me suggestions on what to do and where to go. The way the receptionist welcomed us, Jésus gave us very good information about the best parts of Granada! Also the other receptionist was also very helpful by helping us with the AC and lended us glasses. Beautiful room (203), spacious and high ceiling. The fantastic beds that were extremely comfortable! A nice breakfast. The whole hotel was great. The best place we’ve stayed in in Spain so far and also the cheapest! Shared bathroom was exceptionally clean and the sink in the bedroom was a great touch. Close to the best parts of Granada including being on the same street as the Alhambra! Miriam was fantastic and offered many great recommendations. Balcony was cute. Bed was comfy. 10/10. The location & property/ room & facilities itself was perfect. A beautiful breakfast room and common lobby living room was very nice especially since we got there early and could not check in til right at 3 pm. Staff were polite but didn’t go out of the way to be helpful or give recommendations like other hotels we stayed in Spain. While traveling Spain for three weeks, this was the best place I stayed! Super clean, nice staff( VERY helpful ! ), quiet and safe. I had trouble staying in Spain coz of hotels so this place felt like a savior of my whole trip. If I had next time in Spain, Granada would be the longest stay and this place should be where I would stay for sure. This place is amazing! Beautiful, clean, kind, inviting. Amazing location, staff, rooms and facilities. Enjoyed the steam room and sauna. So many little extras like candy in the lobby and on my pillow. Beds comfortable, spacious, shower was excellent. I loved my stay. Highlight of accommodations for Spain. Although this property is old, it is clean and we'll maintained. The staff is very friendly and prompt to asisst. Since it is a camping hotel there are lots of toilets and showers if your kids are taking too long in your room bathroom. I would stay again if I visit Granada on future trips to Spain. The hotel was beautiful internally and the staff were excellent. Our bedrooms were the best we had encountered in Spain so far. Very well appointed, clean, comfortable, with a large bathroom. For once we even had a kettle! Hallelujah! Having traveled for the past 2 months in Spain this apartment was a treasure. Super clean, spacious, well designed with lots of kitchen amenities. The location was central and fun yet quiet for sleeping. The staff were very helpful. Great hotel in the old part of Granada, not easily accessible with a car, best to park where the hotel suggests and take a taxi or 10 mins walk. Quirky rooms, all different but well appointed. We love it. This is the best one during my 11-day trip in Spain. The room is big, the staff is sweet, the location is so convenient. Everything is amazing! I hope I can be back someday soon. Amazing hotel, great location very central. Spacious and very clean room. Best was the staff, very professional and friendly. Will definitely stay there if back to GRANADA. Second time to stay with Catalonia Granada. Really recommend it. All the decoration is new and clean. Bed is really comfortable. The best sleep during my trip to Spain. The location of the HOTEL is the best of you have few days in GRANADA, the facility has its own charm. Best breakfast in Spain. Staff was polite and helpful.